In my continuing quest to have every letter of the alphabet represented in my name, last week, I gave myself a week off from physical exercise to focus on exercising my brain. That exercise came in the form of the 5 day training crash course for a Certified Energy Manager (CEM) certification. It was actually 4 and a half days of lecture followed by a 4 hour exam during the last half of the fifth day. If I pass, I can then add the letters CEM to the other two sets of initials already following my name (and the count is up to 14 letters). 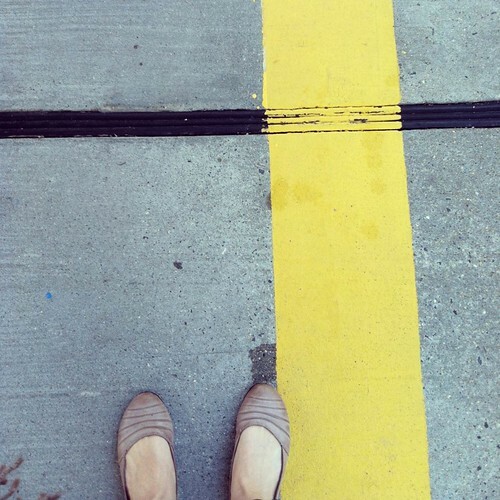 It’s a measure of ambition if you will (or another example of over educating myself out of a husband…as per my very loving mother). With a week off from physical exercise, my body, being ever so efficient, took this opportunity to also come down with a cold. 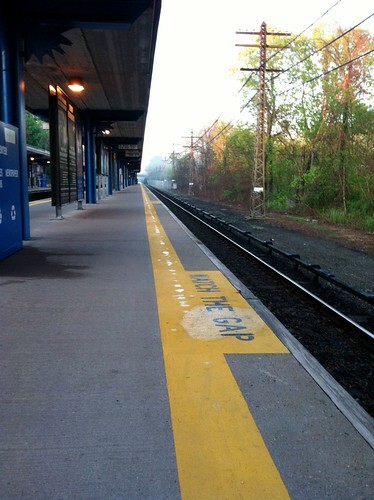 5 days of commuting two hours via train, sitting in a terribly conditioned room for 9 hours of constant lectures, commuting another two hours home to “study” for a couple of hours before going to bed to repeat again, while sick is not pleasant. For me or anyone around me for that matter. So by the time the exam was declared over (4 hours goes by fast) that Friday, and papers were handed in, I was finally able to breathe (in between the horrible coughing that was my lungs attempt to jump ship) and was promptly ordered by my mother to take Saturday off and just take it easy at home. 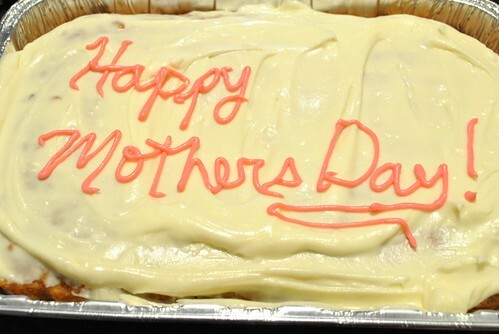 What she really meant was she wanted me to bake her two cakes for Mother’s day. Being the ever loving and dutiful daughter, I obliged. I stayed in on that gray Saturday and while my loafer, fridge raiding brother visited and took a nap through Casa De Mi Padre, which surprisingly, even though it was in Spanish, and I was way too far to read subtitles, I was still able to give him a pretty good synopisis when he finally woke up (which doesn’t say much about the depth of a Will Ferrell movie), I made two cakes. One for her to take with her to share with her hiking group after their Mother’s Day hike, and another to bring to our Mother’s Day get together at a family friends later that day. For her hiking group, I made a Carrot Cake from my favorite America’s Test Kitchen Family Baking Book. 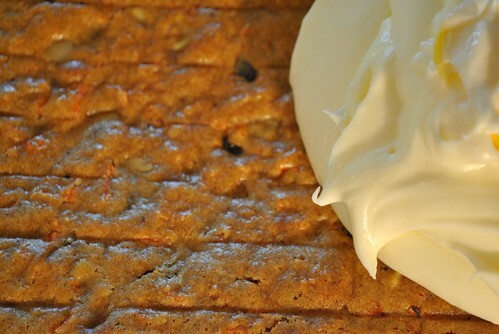 It was a simple carrot cake recipe, and I made it in one of those disposable aluminum pans (that came with a cover) for ease of transport and serving while in a parking lot. I topped it with a Cream Cheese Frosting from Joy The Baker’s Cookbook (I like that her ratio of cream cheese to butter is 8oz cream cheese to 1/2 cup butter). I added a cupful of raisins and a very generous 1 1/2 cups of toasted chopped walnuts. Even though I fully intended to serve the cake in the pan, I did not cool it entirely in the pan. I prepped the pan with a good blast of Pam cooking spray and whipping it down a bit with a paper towel before putting a parchment paper sling along the long side. I let the cake cool in the pan for a good 10 minutes before flipping it out onto a cooling rack and letting it cool all the way that way. Otherwise, even though it was an aluminum pan and would cool down quickly, I was afraid if I left it in the pan to cool, the bottom would get soggy from any trapped steam that may form during cooling. Best to let it cool out of the pan, then flip it back into the pan when ready to frost. I reserved some cream cheese frosting and added 5 drops of red food coloring I had left over from the following Red Velvet cake. I love disposable piping bags. If you mess up because there was a clot or air bubble in your piping bag, don’t dispair! 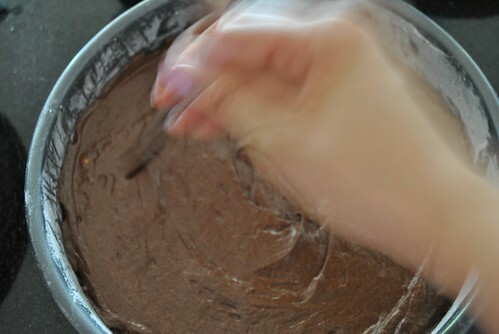 Just carefully scoop out the mess up and smooth out the frosting a bit. Good as new! 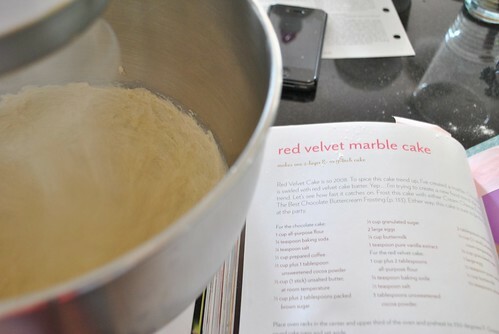 The next cake I made was a Marbled Red Velvet Cake out of Joy The Baker’s Cookbook. 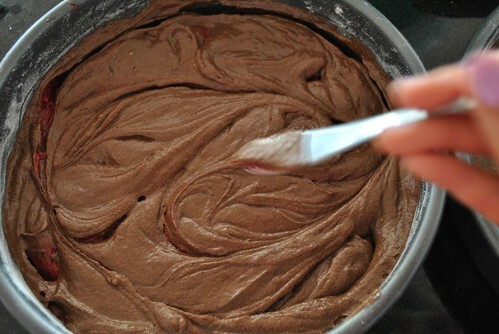 Making a cake like this makes you want an extra mixing bowl for your mixer that much more. Is it too early to ask for one for Christmas? 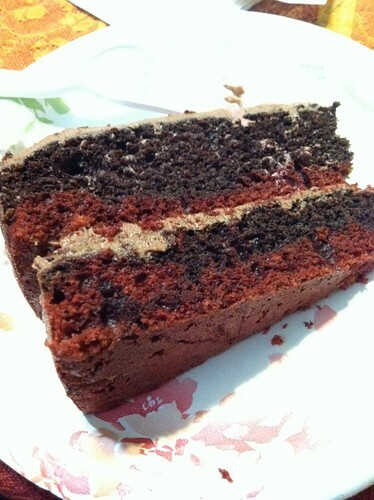 The half cup of coffee required for the chocolate cake is a good excuse to run to Starbucks for a cup of coffee. I take mine black, so I just poured out a half cup before drinking it. If you take cream or sugar in it, just hold off till you get home to add the cream or sugar. 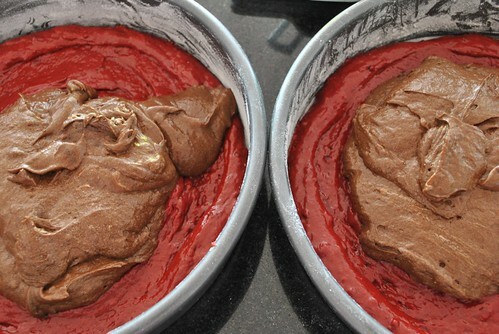 I used a Dutch Processed Cocoa Powder for the chocolate cake, and a regular unsweetened cocoa powder for the red velvet. 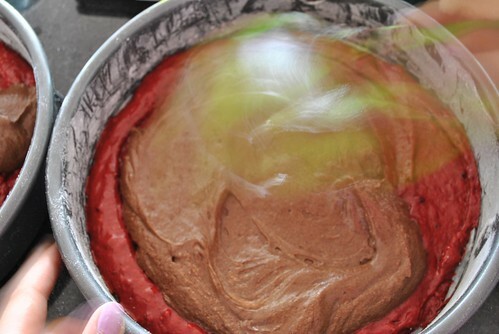 I had some issues when I was mixing together the red food coloring with the cocoa powder. I think I may have had too much powder or something because it just ended up as a dry clumpy mixture as opposed to something more smooth. Probably next time I should sift the cocoa powder to help lessen the clumps. This lead to some unfortunate clumps that remained present in the red velvet portion of the cake. 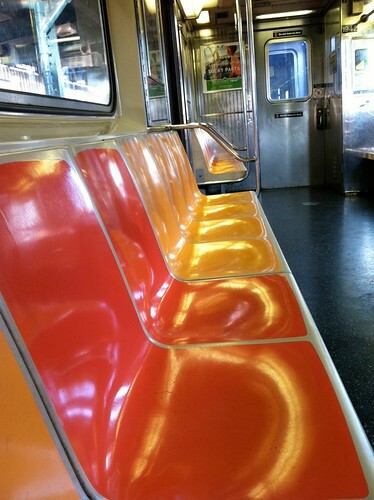 If you look at these photos you would think it was a bright sunny day out. But it was most definitely not with a thunderstorm threatening to run through town. However, with a tripod and some long exposure times, you would never know! Tripod = Awesome! I made a batch of Chocolate Cream Cheese Frosting (made with unsweetened cocoa powder, also from Joy the Baker’s Cookbook) from some leftover cream cheese and half a stick of butter. I never use the full two cups of powdered sugar called for, and just eye ball it till the frosting reaches a desired consistency and sweetness. Although it says that a full batch of the cream cheese frosting would be enough to frost a two layer 9″ cake, I’m skeptical. I did decrease it a bit, but I had barely enough to fill my two layer cake and just frost the top. The feedback I got from the Carrot Cake was that it was delicious and the frosting wasn’t too sweet, which works for my mom’s friends. She said they loved how the cake was moist and springy and not dense and hard like they found other cakes to be. A success, I gather. 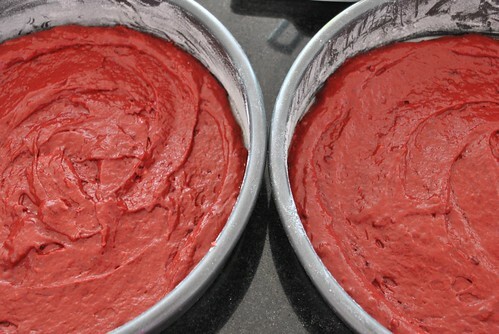 As for the Marbled Red Velvet Cake? Not my best work. It didn’t marble at all, or at least it was not very noticeable It was like a chocolate cake with a red bottom. 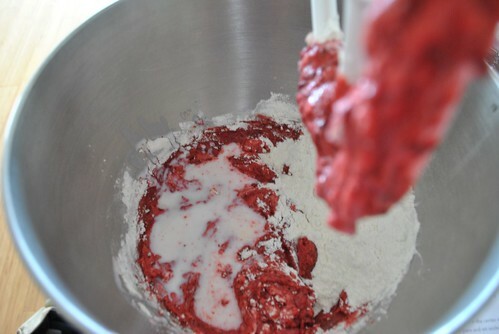 Plus, I am sure I over-mixed the red velvet cake batter. 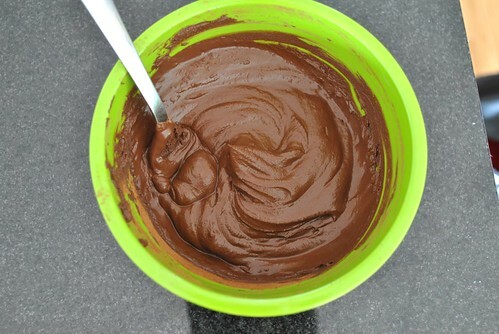 I had my suspicions at the batter part, but it wasn’t until I tasted it that I was sure. Over all it was pretty yummy, at least the chocolate cake part was, just not as good as I wanted. 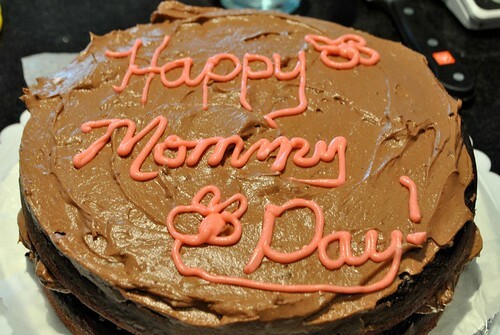 Maybe next time I’ll try doing it but with a lighter colored vanilla or yellow cake instead. 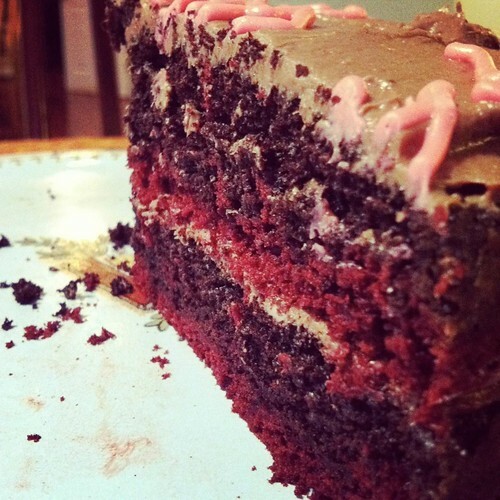 This entry was posted in Cake, Dessert, Uncategorized and tagged America's Test Kitchen, Carrot Cake, CEM, Chocolate Cake, cream cheese, Joy the Baker, Mother's Day, Red Velvet. Bookmark the permalink.